Derek Osbourne, the Leader of Kingston Council has been arrested on suspicion of possessing indecent images of children. The Liberal Democrat Council leader and Councillor for Beverly Ward which includes part of New Malden was arrested yesterday (Tuesday 11th) morning at his New Malden home. He was taken into custody at a south London police station, and has been bailed until August, while further investigations take place. According to Councillor Liz Green, the now acting leader of Kingston Council, Councillor Osbourne has resigned from the Liberal Democrat group. She added "We are deeply shocked by these allegations but I am unable to comment further as we must now allow the police the time and space they need to investigate the allegations thoroughly and without prejudice." 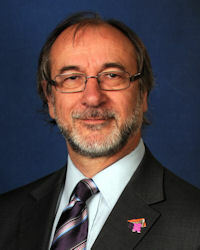 Derek Osbourne, now 59, was first elected to Kingston Council in 1986 and was deputy leader from 1994 to 1997. He has been leader since 2003 after serving temporarily in 1997 and 1998. He was also the Liberal Democrat parliamentary candidate for Kingston upon Thames in the1992 general election, standing against the then Chancellor Norman Lamont. Councillor Osbourne sits on Kingston Council’s ‘Achieving for Children’ committee (for the creation of a joint children's services department between Kingston and Richmond upon Thames) and he also Chairs the ‘South London Waste Partnership Joint Committee’ which was responsible for the recommendation to site a waste incinerator in the London Borough of Sutton. A spokesman for Kingston Council has said: "Everyone connected with Kingston Council is shocked by this news and we will of course assist and support the police investigation in any way that we can." Mr Osbourne is expected to resign as a councillor later, said a spokesman. Kingston Liberal Democrats are set to choose a new leader by the 24th of June. This person will automatically become the Council Leader. The by-election for Mr Osbourne's seat will be held on the 25th July. The main parties have chosen their candidates for the by-election on the 25th July. The Conservatives have chosen Terry Paton, a former policeman and father of two who lives in Portland Avenue, New Malden. The Lib Dems have gone with Lesley Heap, a swimming teacher and the wife of existing Beverly ward Councillor Trevor Heap. The Greens have chosen Chris Walker who is the only candidate so far to have also stood in the 2010 council election. Marian Freedman, a school governor at Burlington schools for 25 years who has lived in Malden Hill since 1977 is standing for the Labour party. This could be a very interesting election because of how the popularity of the parties has changed so much since the 2010 election. In 2010 the Lib Dems were elected with about 45% of the votes. The conservatives were on around 35% and Labour had around 12%. However that was the high water mark for Lib Dem popularity and the low point for Labour. With Labour now close to double their popularity since then and the Lib Dems less then half theirs, many Lib Dem voters could be switching to Labour, the Conservatives or even the Greens. It will also be interesting to see how trust in the Lib Dems has been affected given the reason for this by-election.